Based on the international bestseller by Tom Rob Smith and produced by Ridley Scott, Child 44 arrives on our cinema screens with its pedigree solidly stacked. A prestige cast, a proven director, an experienced Hollywood screenwriter with an adaptation of a hugely popular novel. But as with any page to screen translation, Child 44 runs into the dilemma of what should make it to the screen and what shouldn’t and at what expense to the narrative. Set in 1953 Soviet Russia, the film tells the story of Leo Demidov (Tom Hardy), a war hero who has risen through the ranks of the MGB, the state’s domestic security outfit, as a star investigator of dissident activity. When his friend and fellow-agent’s young son is found dead, Leo is given the task of presenting the file of the State’s findings in the case. In the Stalinist system where ‘there is no crime in paradise’ he must officially state the death as a tragic accident, ignoring the obvious evidence that a murder has been committed. Leo accepts the protocol within the MGB but when his wife Raisa (Noomi Rapace) is named as a spy by a suspected traitor, he chooses not to denounce her and stands by his wife. 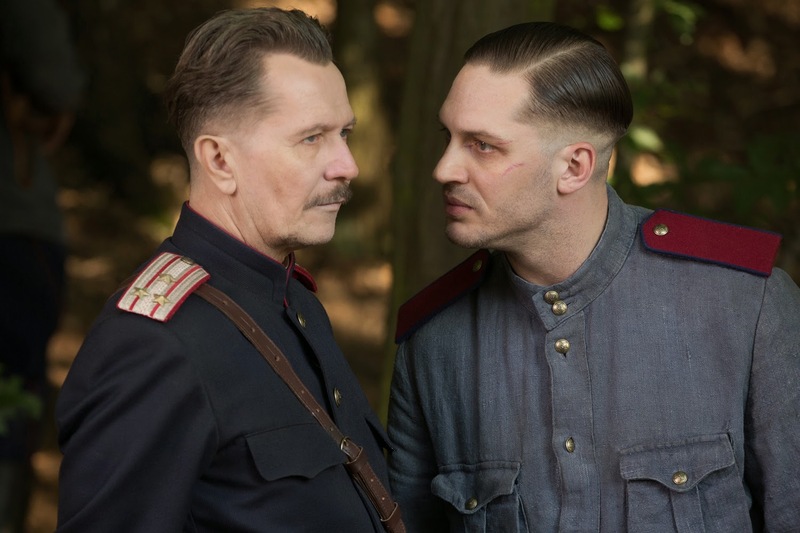 As a result they are sent into exile to the industrial outpost of Rostov where Leo takes a position with local Police Chief General Nesterov (Gary Oldman). When a boy’s body is found nearby with exactly the same injuries as in Moscow Leo begins an investigation into a series of child murders stretching along the train tracks from Moscow to Rostov. Hounded by an old MGB rival Vasili (Joel Kinnaman) who has thrived in Leo’s ruination and who suspects him of hunting a murderer, Leo and Raisa must keep one step ahead of him and find the killer before he strikes again. Child 44 is an engrossing story spread across a wide canvas with interwoven plotlines. On one hand it’s a clever, tense spy drama while on the other a murder mystery and you can see how it would have worked very well as a novel, binding all the various threads together. As a film though you can sometimes feel the gaps in execution and some characters while given room to stretch on the pages of the book are more confined here. Tom Hardy comes out the best of this, (playing the part with a flawless Russian accent) and you can feel his pain for the child victims and the undeniable love he has for his wife. Noomi Rapace is terrific although her motivations seem to change on a whim rather than have slowly and more believably built up. Kinnaman plays the psychotic Vasili with just the right measure of spite and menace and Oldman is, well he’s Oldman. Always good. Originally slated for Ridley Scott who handed over the reins to Swedish director Daniel Espinosa (Safe House), the film perfectly captures the fear and mistrust pervaded by Stalin’s communist rule. Written by screenwriter Richard Price (The Wire, Ransom, The Colour of Money) the script is taut with moments of shock and violence, particularly a scene in which Leo and Raisa are attacked in a crowded cargo train. There will be plenty for fans of the book to enjoy here but those who haven’t dived in may find they are watching an incomplete jigsaw, interesting and well conveyed as it is.